Our revolutionary Health and Environmental Cleaning Systems (HECS) employs cleaning solutions made from eco-friendly plant extracts that destroys the bacteria and allergens that irritates your skin. 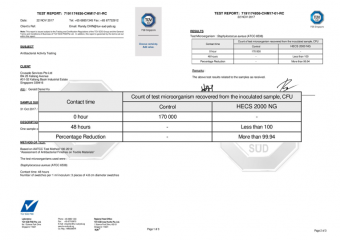 Our specially formulated Anti-Microbial solution, which forms a crucial part of our Health and Environmental Cleaning Systems (HECS), is backed by the PSB ODS-Free Verification Certification. We gets your soft furnishing comprehensively cleansed through patented Anti-Microbial and Anti-Fungal treatments that effectively eliminate the harmful bacteria and allergens that trigger coughs and colds. The HECS Protective Treatment is then applied, covering your furnishing with a self-sterilizing layer that continues to fight microorganisms for the next three months, keeping them clean and fresh for longer. The anti-microbial component kills all microbes including multi-resistant bacteria species, fungi, mould and yeast harmful to humans. A protective self-sterilizing coating foamed on treated surfaces. This anti-bacterial layer continues to kill bacteria and fungus for a period of three months. This is a picture showing the effectiveness of HECS Anti-Microbial Treatment. 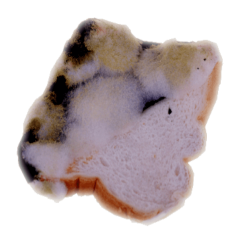 Mould is present on non-treated area on the bread. The mould does not cross multiply on the TREATED area.